Friday March 24, 2017: Justin hears about the kidnappings, Sonny's anger boils over with Brady, and Adrienne has a meltdown. When Brady walks into the Kiriakis mansion, Sonny tries to tell him what Deimos has done now. Brady doesn’t really have time for that now so Sonny gripes at him for making Nicole his priority. He can see Brady’s fallen back in love with her. He stomps out, leaving Brady with his jaw on the floor. Hillary stops by Nicole’s cottage in Canada and slips up, forgetting the lie that Brady made up about his job. Hillary questions her. Nicole finds his work boring and snaps that she doesn’t really know what he does. Hillary apologizes and when Nicole hears a slam, she gets nervous. Hillary says not to worry. They’re safe. She pulls a gun out of her bag and says she’s a cop. Nicole’s uneasy. Hillary leaves. From his office at Horton Center, Eric takes a call from a runaway, promising that if they come to his office, they can talk. Jennifer arrives and tells Eric how proud of him she is. He thinks she’s overstating things. He asks after Abigail and Jenn says she’s doing well. Jenn plans on exposing Deimos. She starts lecturing Eric about his life until he tells her to shut it, then she takes off, bumping into Brady on the way out. The men discuss all the letters they’ve written over the past several months. Brady knows Daniel would have wanted Eric to go on living. Eric doesn’t want to talk about that. He heard Nicole’s in trouble. Brady says he’s been helping her out. He gets a call from Nicole, saying she’s afraid. When Hillary returns, Nic says she’ll call him back. They disconnect and Eric realizes Brady loves Nicole. Brady sighs. Eric’s glad his brother’s helping her. Brady’s glad Eric returned to town, calling him one of the best brothers a guy could have. The men embrace. Adrienne finishes a call with her sons at the hospital as Justin arrives with Kate and Dr. Ong (played by Sumalee Montano), who asks if she’s ready for her mastectomy. Adrienne says she is fine. When everyone leaves the room but Kate, Adrienne bursts into tears, frightened, saying her new breasts will be ‘bags’ and not real. Kate comforts her. Sonny arrives and tells Justin about the kidnappings. Kate interrupts, telling everyone that Adrienne had difficulty but she’s calm now. Sonny goes in to see her and tells her he needs her there. He’ll be there with her every step of the way. Adrienne tears up, feeling strong. He goes and Kate returns. Adrienne thanks her for being her rock before the men return and the orderlies take her into surgery. Later, Ong returns and tells them the surgery went well and they’re reconstructing now. They demand to know what Adrienne said before she was wheeled away so Kate confesses she said, “Tell him I love him.” She passed out before she could give a name. Rafe and Hope arrive at the Brady’s pub talking about the latest kidnappings. Rafe sees Deimos and goes at him. Hope pulls him off the Kiriakis, who says he was sorry to hear about his sister, but he’s got the wrong man. He goes. Back in Canada, Nicole opens the door to Hillary, who apologizes for scaring her by pulling her gun. She invites her for dinner. Nicole declines. 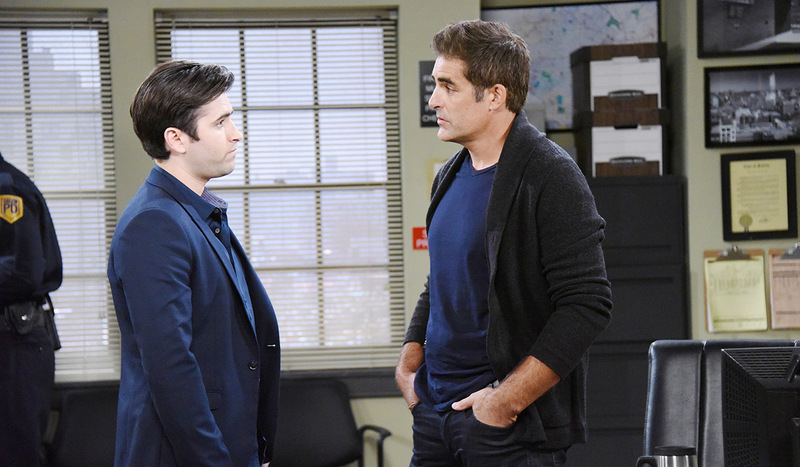 At SPD, Rafe and Hope discuss the kidnapping case. Rafe calls Sonny, asking him to drop by, while Hope calls Deimos and tells him to meet her at the house. She goes and Sonny arrives. Rafe asks him to be on the inside to help take Deimos down. Sonny’s in. Hope arrives at the Kiriakis mansion and asks if Deimos will retaliate against Rafe for attacking him. He talks in circles but doesn’t answer the question. When he goes to take a call, she plants a bug and goes. She later stands outside the pub and overhears Deimos telling someone to stay on Brady who will lead them to Nicole. Back at the Horton Center, Eric writes a letter to Nicole. Jenn appears and he shoves the letter in a drawer. Jenn apologizes for earlier. He runs out, saying the runaway girl wants to meet, and Jenn’s gaze lingers on the drawer. Jade’s manipulations take a turn. Dario has something to tell Abigail.